Here in Marmaris? Then it would be such a shame if you leave without seeing as much as vacation spots nearby. 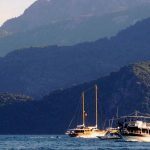 We always try to indicate how important it is to visit Icmeler at least once you are here – going there by a nice walk on the coastline would be even better because of its closeness to Marmaris- our opinions for Turunc is exactly the same. Initiate your trip from Marmaris to Icmeler, you will see the signboard of Turunc once you follow the road that will take until the exit of Icmeler. By following the way after seeing the signboard, you will meet the breathtaking seascape of İcmeler for the very first time from a great highness while you serpentine. If you are travelling by your own vehicle, we strongly advise you to pull over for 5 minutes in order to savour this great view. The main road will split in half and one way will diverge to the right side; that road will take you directly to the Honey House of Marmaris and following that, an area full of great traditional cafes famous for their well-served breakfast. By the way, if you are searching for further information about other vacation spots, please check out our other articles we have prepared for you. If you are willing to have a peaceful and calm vacation, Turunç will be a perfect choice for you. The place, in fact, known as an old fishing town before starting to develop itself after the year 1970 and becoming an important holiday centre on the coastal line. Turunc is now one of the most frequent destinations for cruise boats and yachts because of that ageless reputation. It is possible to see lots of local and foreign flagged boats anchored along the shore. Despite being full of restaurants, hotels, pubs etc. ; Turunç has successfully managed to protect its natural beauty. This, and also its aquarium look-alike sea that is combining with golden sanded beach and calmness is the reason why Turunç was granted the prestigious blue flag award. Comparing to Marmaris, due to its quieter and calmer character, Turunç would be the best choice for those who is searching for a more chilled holiday either with their beloved ones or on their own. The climate is generally hot and moist during the summer months, mild and sometimes a bit chilled during winters. Therewithal, temperatures surely reach the highest numbers during June and July. Although Turunç is especially preferred on summer season by foreign tourists; ironically it is not as popular as Marmaris for Turkish visitors. One of the best things about Turunc is that you can plan your trip just in any period of the year because of it’s always warm climate. Having said that, if you are not a big fan of getting a tan; swimming but hiking and sightseeing instead, it might be better for you to plan your trip in spring or autumn. But once again, Turunç is full of surprises and waiting for you to show its different types of beauties anytime during the year. Turunç is 25 km far from the central Marmaris, which is located 55 km south of Muğla. The location helps you to easily find a bus from most of the cities in Turkey and reach Marmaris. If you travel to Turkey by plane, and if you arrive at Dalaman airport which is only 90 km far from Marmaris, you can easily reach Turunç by taking a cab or public transportation. You can also prefer using private shuttle services instead. If you travel by car; after passing Marmaris, just keep your eyes on the road and the signboards will take you directly to Turunç in 45 minutes approx. Once you are here in Turunç, you won’t need a vehicle to explore the area. Everywhere is close to each other and you can go one place to another on foot or by bike, it’s up to you… You can see bike rental spots almost in every corner while you are walking around the village. How to Spend Quality Time in Turunc? Well, this is the easiest question by a long shot! There are so many activities that you can do in this fabulous area. As we have mentioned above, you can explore Turunç by bike or go on hiking tours if you are a fan of nature. Moreover, you can have a wonderful time with different types of water sports. Boat trips, scuba diving, fishing tours are the most famous and popular ones that come to our minds now. The sea here has such unique turquoise colour which will fascinate you and make you get rid of all the stress and uproar that city-life caused you. The local market of Turunc is only a couple of minutes walk from the harbour and it is opened every Monday at 8 am where you can find home-made souvenirs, leather products, best quality towels; as well as fresh food, ready street food, fresh served traditional pancakes, soft drinks etc… Apart from this local market that opens once in every week, souvenir shops can be found in every corner of Turunc where you can collect some of the unique souvenirs either for you or your friends that will remind your lifetime memories in Turunç. Turunç has one of the most popular beaches around and it is only 25 kilometres far from Marmaris. As earlier mentioned, it is awarded the blue flag due to its shockingly clear sea water and clean beach. Also, the bays of Turunç are preferred by scuba divers because of the rocky shore and numerous sea caves. You shouldn’t miss that spot if you are willing to see the bays of Marmaris. Since you are here and enjoying the great nature of Turunç, it would be a huge loss not to visit the two spectacular bays called Amos and Kumlubük. We can call them neighbour bays because of their closeness to each other therefore it would be a wise decision to spare one day for those two cute neighbours before leaving Turunç. Kumlubük is an outstanding area where you can savour the perfect combination of sea, sun, golden beaches and visit its famous cave. We should say that the restaurants are the best to find perfect served fresh fish. Like most of the places around, hiking in the perfect nature is another alternative. The ancient city of Amos, which is half an hour walk distance to Turunc, is located on top of a hill between Turunç and Kumlubük. The view of both sunset and sunrise from the top of this hill is just phenomenal. The ancient city keeps its mysterious archaeological remains and old theatre in the heart of the city walls.